Dave and I finally saw Coraline yesterday, and despite the ten year old kid sitting behind us who would ask (at full volume) "what does she need the key for?" "Where are her parents?" and "What's her name again?" incessantly, and be answered (also at full volume) very patiently and with no attempt at shushing. Despite all that, we loved it, and are so glad we saw it in the theater, because while I'm normally not so much into 3D (gives me a headache), this was used sparingly and to terrific effect. (The stitching of the doll during the opening credits, the rain on the window, the dust on the windshield--spectacular). self-reflection, and a fascination with the strange and the dark. 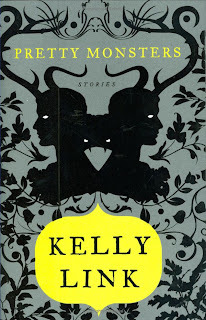 Neil Gaiman has it, as does lesser-known short story writer Kelly Link. (Heh--Amazon has them as a buy-together-with option). Dave got me Pretty Monsters for Christmas, and I read it in fits and starts--I'd start a story, read it through, and then be unable to move on to the next without reading something in between. There are familiar elements in each story ("Magic For Beginners" has a tv show that's like Buffy on shrooms/steroids, and "The Wizards of Perfil" is set in (mostly) your standard fantasy novel) but they are opened for examination, and then twisted--it's very uncomfortable, if fascinating, experience. The stories don't end--they just stop. The closest comparison I can think of is the last episode of The Sopranos, and however you may have felt about that, in Kelly Link's case, it's like (to use another film/tv analogy) the ending of Chinatown--it stays with you, whether you like it or not.